Cherry Blossom Festival, April 20th, 2018. 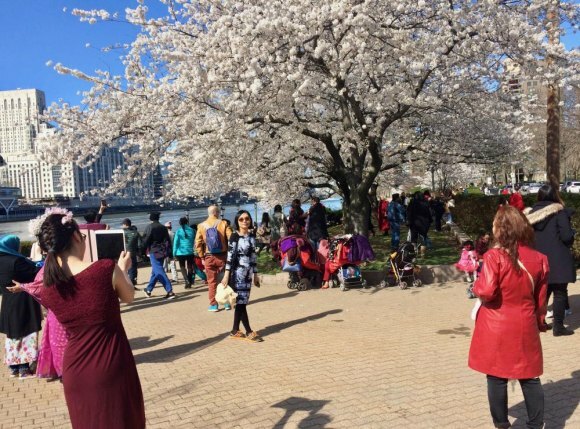 "The Roosevelt Island Residents Association (RIRA) is pleased to announce that the Cherry Blossom Festival will proceed as planned," according to a Common Council press release. "On Sunday, February 24, the RIRA Common Council passed a motion to support the Cherry Blossom Festival’s fundraising efforts and budget," it added, but something was missing. The anticipated costs of additional security and other measures have been assumed by the Roosevelt Island Operating Corporation, as of late Friday afternoon, February 22, 2019. But no companion announcement came from RIOC, not even a quote for publication, and President/CEO Susan Rosenthal did not confirm the information. As a State agency, RIOC's generally not free to release open-ended financing over $25,000 without Board approval. When you think about it, though, there's a more troubling problem. "Late Friday afternoon," RIOC executives were preoccupied, dealing with an unexpected need to shut down the Tram on Sunday. It hadn't yet been announced, and some were scrambling to meet the needs of residents for alternate transportation. Shouldn't the abrupt Tram shutdown have been the Common Council's most important consideration, as it was RIOC's? And that's even if you believe the Common Council should be wasting resources organizing festivals at all while failing at its main mission of resident advocacy. What happens to the Common Council's power of persuasion when it goes hat in hand to RIOC to save itself from an avalanche of embarrassment? RIOC's doing the right thing. If it really is picking up the outrageous costs Common Council President Lynne Shinozaki said were needed, it should be doing more of it. Only through RIOC's neglect is the Common Council in a position to fritter away energy organizing festivals and Easter Egg Hunts. Common Council is not RIRA. The Roosevelt Island Residents Association is a group to which everyone living here is said to be automatically enrolled. The Common Council is an elective group laying claim to represent RIRA based on elections held every two years. But its hold on that claim is tenuous. It's tenuous, first, because it knowingly carries on an elitist tradition of refusing to recognize longterm residents in our rehabilitation centers, Goldwater (now history) and Coler, even though they've at times amounted to as much as 25% of the total population. A more recent addition to the bias is the Council's denial of recognition to Cornell Tech, where some of the most brilliantly fertile minds in the tech world reside. How can the Common Council claim to represent residents while refusing to recognize that roughly 10% of us even life here? In the most recent elections for Common Council seats, where representation's allocated to residential complexes according to estimated occupancy, candidates have never been available for more than 75% of those needing to be filled. You can argue about why so few people are interested, but the unavoidable truth is that the Common Council just doesn't stir enough interest. What do they actually do? In the last election, in November, not a single candidate volunteered to serve from 546 Main Street, and of course, there were no candidates from Coler or Cornell Tech. The only complexes well represented, that is, all seats accounted for, if unchallenged, were Southtown and Island House. The Common Council represents its own narrow interests and personal agendas, not RIRA, the residents of this community. RIOC may do the right thing, standing up to save the Cherry Blossom Festival, but the Common Council has a long way to go to save itself.